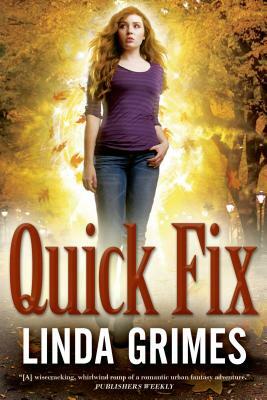 QUICK FIX the second installment of the original urban fantasy series by LINDA GRIMES. Ciel Halligan, an aura adaptor with a chameleon-like ability to step into the lives of her clients and fix their problems for them "as" them is working a job at the National Zoo with her boyfriend, Billy, and his ten-year-old sister, Molly. It's supposed to be a quick fix, giving her time to decide if it's wise to pursue the romantic relationship her charming scoundrel of a best friend wants, or if she should give Mark, the CIA spook she's crushed on since hormones first rattled her pubescent brain, a chance to step up to the plate. Molly has already begun to show signs of being an adaptor herself. She's young for it, but she's always been precocious, so it's not impossible. What "is" impossible is her taking on the form of the baby orangutan she touches adaptors can only project "human" auras. Until now, apparently. Worse, Molly is stuck in ape form. She can't change herself back. Escaping from the zoo with their new baby orang, Ciel and Billy head for New York City and the only person they know can help: Ciel's brother James, a non-adaptor scientist who's determined to crack the aura adaptor genetic code. But when Billy winds up in jail, accused of attempted murder, Ciel begins to suspect Molly's unusual adapting ability is more than just a fluke. Who's been experimenting on Molly, and what do they hope to gain? And will Ciel survive to find out? LINDA GRIMES is the author of In a Fix and its sequel Quick Fix. A former English teacher and ex-actress now channeling her love of words and drama into writing. She grew up in Texas and currently resides in northern Virginia with her husband. —RT Book Reviews, 4 ½ stars, Top Pick!